This is big. 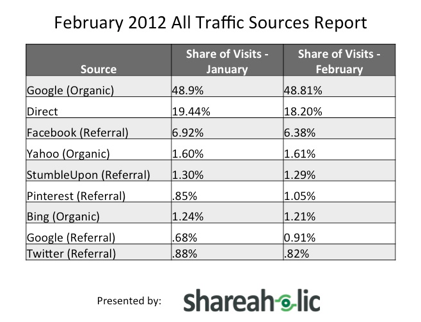 A new study by online sharing tool Shareaholic has found that Pinterest now drives more referral traffic than Twitter. Again, when it comes to referral traffic, Pinterest > Twitter. The data is based on analytics from 200,000 publishers which reach approximately 270 million unique visitors a month. Now, it was big news back in February when Pinterest surpassed Google+, YouTube and LinkedIn combined in referral traffic, but Twitter has made a name for itself as the de facto sharing network with URL shorteners abounding and real-time, concise flow of information. Still, Pinterest closed the gap within the last month going from a .85 percent share of referral traffic visits to 1.05 percent from January to February. The social pinboard site is now trailing behind Facebook and StumbleUpon.